Torrential rainfall caused misery for commuters across the country - with an approaching Arctic front now set to deliver the first major freeze of the winter. Frost, ice and snow on the higher ground are forecast as we bid farewell to the mild weather of the past fortnight, with Siberian-type conditions set to send temperatures tumbling by up to 12 degrees. Downpours of up to 40mm caused traffic across the capital and wider country, while homes were evacuated in Co Laois last night as flooding intensified. Up to 30 families were affected by the move which was ordered because all access routes to the estates outside Mountmellick were severed by the floodwaters. The action was taken as a precautionary measure amid fears the homeowners could be cut off from vital services after gullies around the River Owenass flooded. In Dublin, flooded roads added almost 60-minute delays to rush-hour traffic. Between Tuesday night and 9am yesterday, 39.2mm of rain fell in the Phoenix Park. Flooding caused problems on the Grand Canal Dock to Newbridge rail line with delays of up to 10 minutes. Infirmary Road, Long Mile Road, Beresford Place and roads in Stillorgan, Blanchardstown, and Clontarf were badly hit by flooding, with some being left impassable. 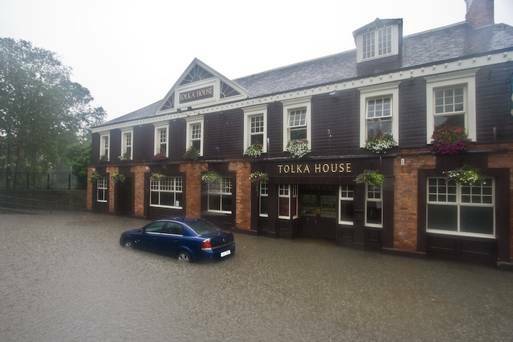 There were questions as to why the River Tolka appeared to have burst its banks, resulting in widespread disruption on the N3, despite a €20m flood-defence scheme being in place since 2011. The Office of Public Works said an initial inspection suggested that surface water was to blame, but further investigations would take place over the coming days. Heavy rainfall also hit roads in Meath and Kildare with large quantities of surface water reported on roads in Clane, Kilcock, Maynooth and Celbridge. Kildare Council was forced to close the R445 Naas-Newbridge road for a time owing to heavy flooding. Rainfall was blamed for a surge in accidents which added to the traffic headache. At one point during rush hour, gardai in Dublin were being notified of accidents every two minutes. Gardai warned motorists and pedestrians against trying to pass through floodwaters. Dublin Fire Brigade logged 47 calls yesterday morning, three times more than normal, with the majority rainfall-related. Outside Dublin, heavy rainfall also caused flooding in Cork, Kerry, Tipperary, Clare and Limerick, while weather conditions resulted in traffic gridlock in Galway. It comes as local authorities across the country insisted they were fully prepared for the icy weather expected from today, with gritting lorries on standby. Homeless charities said additional bed spaces in shelters would be brought on stream because of the impending cold spell. Met Eireann warned that freezing weather will hit the country from this evening, with tomorrow and Saturday set to be bitterly cold as temperatures sink to -3C overnight. Both the gardai and the Road Safety Authority (RSA) appealed to people to drive with extreme care. Parts of north Leinster and Northern Ireland are at greatest risk of snow, particularly along areas of higher ground.